App for Devon welcomes you to our beautiful county. Take a look at our website and then download the app totally FREE. All this information will be at your fingertips wherever you are and whenever you need it! Let us take you on a journey and help you make up your mind how to enjoy Devon. 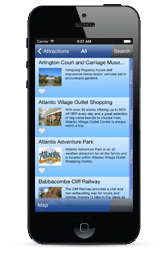 Our App information ranges from 'Accommodation' to 'Attractions' and 'Activities' and everything from adrenalin fun filled days, to National Trust houses and gardens, museums, theme parks and wildlife. Basically, there's everything you need to plan your holiday or days out. App For Devon can guide you around the coast and can even tell you which beaches are dog friendly, plus you can also check out the daily tide times as well. If you want a swim but not at the beach, there are some great indoor and outdoor swimming pools and activities you can visit. If you don’t fancy the beach or watersports, how about horse riding, lake fishing, cycling, boating and many more attractions? Or if that doesn’t appeal, why not spend the day at a vineyard sampling the local wines. If its retail therapy you desire, check out the 'Shopping' category for markets selling local farm produce and other specialist gifts and crafts, or shops selling the latest surf and sports wear. Not sure where to visit, have a look at our 'About Devon' section and read about the different Devon towns and villages, then search around the local area. Don't forget to have a read of our Articles of Interest! Let’s not forget about food and drink with such a wide variety you'll be spoilt for choice. Why not indulge in a traditional cream tea...make sure you put the cream on first! We have a wide variety of 'Eat & Drink', plus many 'Pubs and Clubs' of your choice you can check out. Don’t forget to check the special 'Offers/Vouchers' tab as they will be updated regularly with a huge range to choose from, so grab yourself a money off voucher and a bargain. If you just want some 'Information' in an emergency we can help you too, from local hospitals & dentists to vets & petrol stations, it's all on there! Or if you just want to know what’s going on in the county, take a look at our 'What's On' listing. Please keep checking our site as we are constantly adding new events and information. 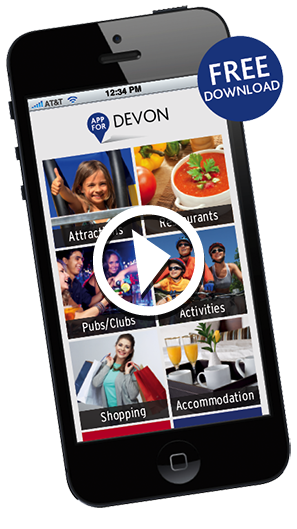 App for Devon is operated by Westward M.S. Limited, a long-standing tourism marketing company with over 30 years experience.